Georgia's Home Inspirations: Apple Santas! Have you heard of apple santas? When I was little, my mom taught my sisters, brother and I how to make apple santas. Every Christmas we made them for teachers and friends and put a few around the house for decoration and fragrance - they smell like a clove pomander! I passed on the tradition to my children and, this year, I have the joy of making them once again with my son, A.J., as he is home for the holidays. He might be 24, but he is still full of child-like wonder at this time of year! Aren't we all? Zip out to the grocery store and pick up the supplies and make a few with your family; they're easy and so cute! Supplies: Bright red apples (pick the ones with the best shape for santa's belly), marshmallows, large red and black gum drops, whole cloves, cotton balls, long toothpicks or cocktail skewers and honey. 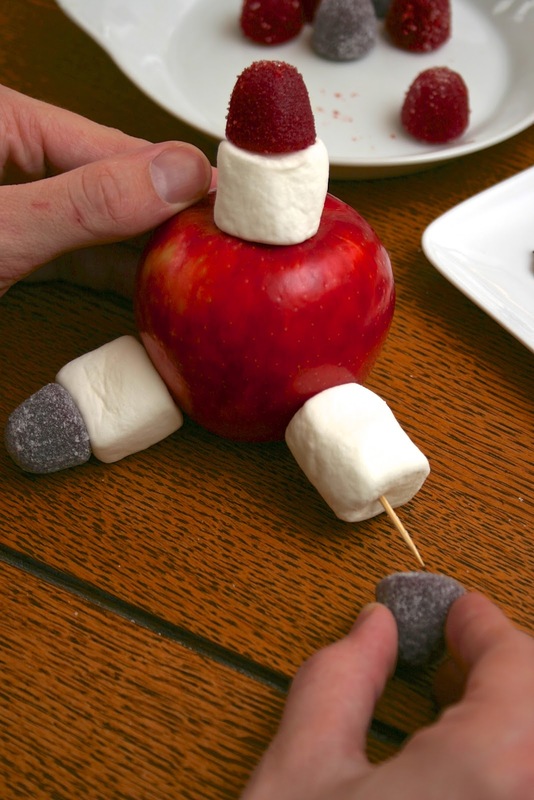 Start by attaching a marshmallow and red gum drop to the top of the apple with a long toothpick. This is santa's head and hat. Attach a marshmallow and black gum to lower sides of the apple. Now you have santa's legs and boots! Stick cloves into the marshmallow head to represent santa's eyes and nose. Dribble a little honey on santa's chest for attaching santa's beard. Stretch out and shape a cotton ball into santa's beard and attach just below santa's head. Finally, add a tiny cotton ball to santa's hat with a little honey if you like. All done; note how everyone's santa has his own personality! If anyone is tempted, santa is edible; just remove the cotton and toothpicks. How fun was this! Lisa and Nikki's Friday Finds New Year Edition!